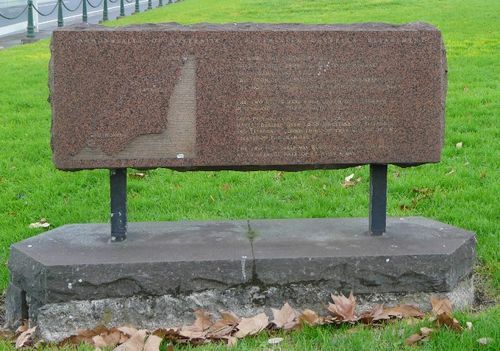 Red basalt stone with relief map marks the Melbourne end of the coaxial cable laid from Sydney in the 1960s. The Sydney-Melbourne co-axial cable was a major telecommunications engineering and construction project in south-eastern Australia in the early 1960s, designed to significantly increase telecommunications transmission capacity between Sydney and Melbourne and other centres, along its route including Canberra. The cable's route was approximately 960 kilometres and roughly followed the Hume Highway as it existed at that time. The Sydney–Melbourne coaxial cable was officially opened on 9 April 1962 when the then Prime Minister, Sir Robert Menzies, made an interstate direct dial call. Commonwealth of Australia Postmaster Generals Dept. To mark the finish of the laying of a coaxial cable from Sydney to Melbourne by Post Office lines staff. This stone was unveiled on the 10th November 1961 by the Hon.C.W. Davidson, OBE, MP, Postmaster General. The two cities were first linked by telegraph in 1858, and by telephone in 1907.